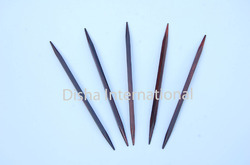 we manufacture Wooden Knitting Needles in various designs and sizes as per buyers requirements and specifications in ebony, rose, mango or kemp wood. Sizes range from 3mm to any thickness with any length be it 6cm, 8, 10,12 or 14 cms long. Each piece will have a smooth surface and same thickness as mentioned. We can also make them in two tones by using different wood for the swivel. Bone or Horn can also be combined for different looks. We are offering customized products. Packaging Details: individual packed as per buyers instructions and requirements. 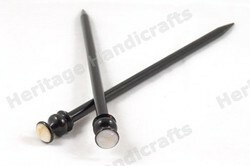 This knitting needles are made in Ebony wood with Shell button fixed to perfection on the swivel head. We use the best quality white shells for our knitting needles. We gaurantee for the same thickness through out the entire needle length. 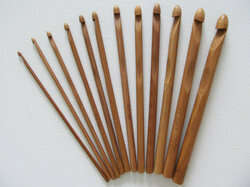 To keep the client satisfied, we manufacture, export and supply high quality Wooden Knitting Needles. Our offered knitting needles are absolutely durable and sturdy. Also our quality examiners check these knitting needles on assorted parameters to ensure their quality and stiffness. The provided knitting needles are available in various sizes and shapes according to the demands of the clients. Besides, these knitting needles are available at nominal prices. We offer customized designs. We are manufacturers and exporters of different patterns and designs of Double Point Knitting Needle. We make single point, double point, circular knitting needle in rose wood, ebony wood, teak wood, Kemp or bamboo. Any thickness from 3mm to 14mm or more with any length can be made as per your specifications. We are offering customized products. This beautifully Square Knitting Needle is made of Ebony wood. A matching BRASS top head is fixed to enhance its beauty. Made in all sizes from 3mm thickness to 14mm with any length upto 18 inches. 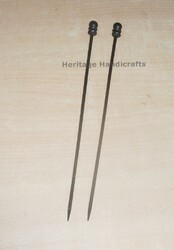 We can make these needles in Ebony, Rose, Teak, Kemp Wood or Bamboo. Top head can be of different pattern as per your choice. We are majorly looking for enquiries from U.K, Europe, USA and other international markets. We are offering customized products. This beautifully Knitting Needle Double Tone is made of Ebony wood in 6 mm with a combination of beautiful pattern of swivel head, a simple swivel pattern which is evergreen to eyes. You will never feel tired of such simple designs and still elegant. You will feel the pride while working with such smooth finish and would never stop knitting. Knitting becomes a passion while working on our beautiful needles. We are majorly looking for enquiries from U.K, Europe, USA and other international markets. We are offering customized products. We manufacture crotche hooks in all possible sizes with any thickness and length. Hook point is made very carefully for the excellent grip and non slippery. All contours and edges are smooth with silky polish. these hooks are made all woods like ebony, rose, sheesham, teak, kadam, surina, mango anf many other woods as per buyer's requirement. 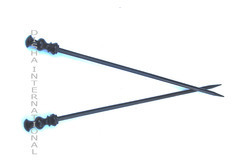 We are manufacturer and exporters of Circular Knitting Needles. We make double pointed single point, circular, square needles, lace bobbins, bobbins, spools and many more wooden handicrafts in different woods such as Ebony and Rose wood. Knitting needles are available from 2. 5mm to 25mm with any length as per buyer's requirement. We are offering customized products. Circular knitting needles are made with extra counciousness for quality, smooth finish at the joints where wire is fixed with the brass cap. We gaurantee for strong bonding of these joints. Any size of circular needles are made at our production unit with ultra smooth finish.